A breakthrough combination of a wall mounted grab bar, and the proven benefits of a pivoting and locking dual rail. 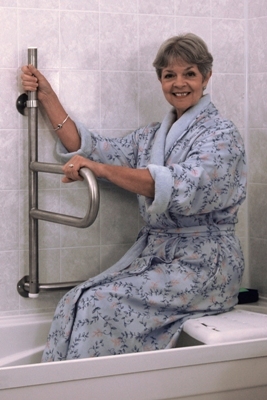 Designed for bathing, toileting, and other environments where grab bars are found. Lift to unlock dual rail, keep rail up to move freely, let rail down to securely lock in place. Stand to shower, lean over to adjust shower controls or use when lowering into the tub. Easy to use ladder-like support for getting on and off the toilet. Dual rail extends 20”/51cm from wall to provide a weight bearing surface for safe entry and exit from the bathtub. Easily Installs Like A Grab Bar. Mounts securely to structural studs, with 3 contact points for added strength. Bottom grab bar is reversible for a left or right side installation. Stainless Steel Construction. Unlike zinc or chrome plated grab bars that can chip and rust, the Dependa-Bar™ will never rust. Incorporates all applicable ADA Guidelines (Wall Clearance:1.5”/3.81cm). Dual Rail Length: 17"/43cm (5"/13cm spacing between rails).